Noise Reduction in dB, narrow band, octave and third octave. The elements of the Transfer and Scattering Matrices for each element and for the full network. Sound Pressure RMS and phase at each node in the network. (Pa or dB, narrowband, octave and third octave). Sound Power exchange to and from the network at each node. (W or dB, narrowband, octave and third octave). 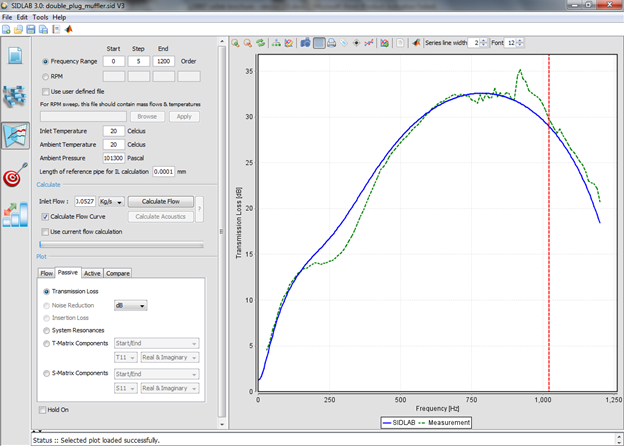 Sound Pressure RMS outside the network at a predefined receiver position. (Pa or dB, narrowband, octave and third octave). Transfer Function between any two nodes in the network. Work with different unit systems to define the dimensions of the network: m, mm and inch. Save different versions of the design in the same project. The fluid medium can be a perfect gas or a liquid. Available editable library of common fluids. Element Manager: Add new elements, delete elements, and modify their list of properties. 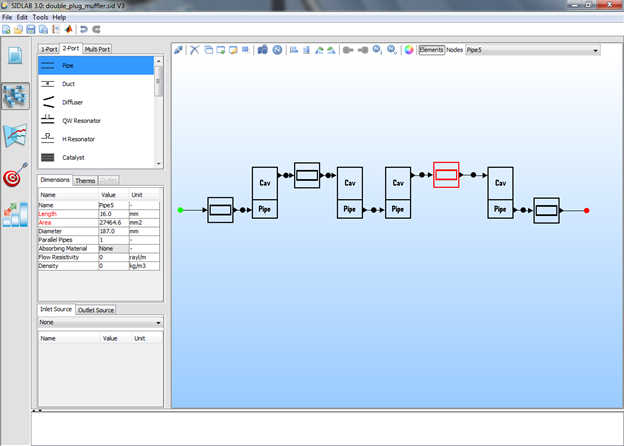 The system network can be drawn in 2D or 3D with a variety of drawing and editing tools. Drawing the network in 3D has no influence on the calculation. 3D Networks are only for visualization purposes. Several convenient ways to manipulate the results and export them in different formats. Optimization: Optimize the system performance (TL – IL – radiate pressure) for a range of frequencies using any number of variables. Define equality and non-equality dimensional constraints. Possible to include the allowable pressure drop as a constraint. Parameterization: Choose a single parameter inside the network, perform a parametric analysis by varying the value of this parameter within a specified range with a specified step. The results are shown for all values of the parameter simultaneously. Inlet and Outlet End Caps. User-Defined frequency dependent pressure source.